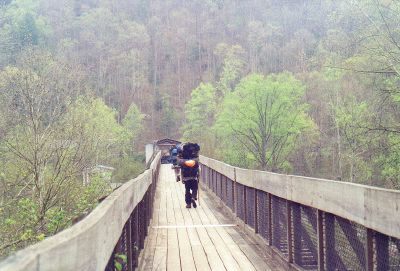 We left the trail to check out an interesting sideshow.Not a sound except for birdsong and the knock of my walking stick on the bridge. A mining community was established here in the 1930's. 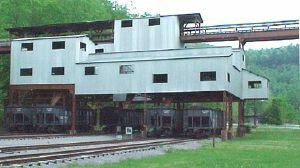 A large coal tipple, modern by industry standards, was built. An electric trolley, also considered state of the art, was installed. It could pull up to 45 gondolas. Narrow gauge track ran throughout the hills to access the black seams. A ranger we spoke with pointed out that this community represented the transition from a largely subsistence and barter-based economy to one that traded money for labor. Unions never became very popular; it has been said that the Stearns Company tended to be paternalistic. It seems that the people who worked here were pretty humble and did not demand much for themselves. At times the men were paid in scrip which could only be spent at the company store. The miners had to buy their own clothes, boots, picks, shovels and lanterns. When the diesel engine became popular, new environmental and safety regulations made mining at Blue Heron uneconomical. In the end, there wasn't that much coal to be dug here after all, and the operation folded in the early '60's. The track was pulled up and the bed became part of the Kentucky Trail. The history of the Blue Heron community has been made into a self-guided museum which includes steel skeletons of the old buildings in their approximate locations with exhibits at each one. There is a store, a church a school, domestic quarters, a mine and the industrial buildings which surround the tipple. One such building is a concrete original where a good supply of fine sand was stored. 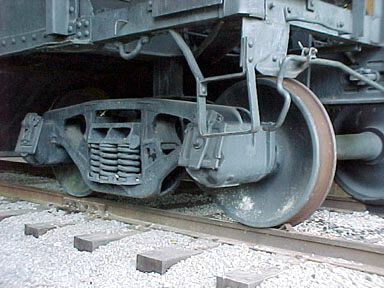 It was used for traction on uphill sections of rail where the wheels of the trolley engine tended to slip. 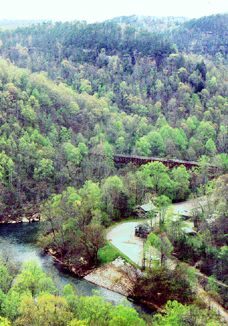 In the first picture shown above, we are crossing high over the river where the tram used to run. 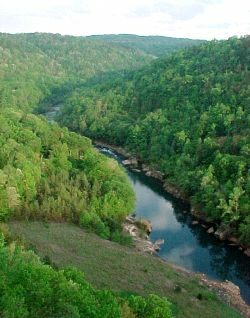 <-This shot shows the Big South Fork upstream from Catawba Overlook on the Kentucky Trail. 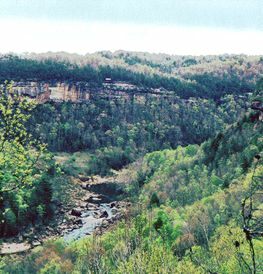 Blue Heron Overlook is visible across the canyon (that little shed roof on the edge of the cliff). 400 feet below are the Devil's Jump Rapids. This is where the Army Corps of Engineers had proposed the construction of a dam as early as the 1930's. 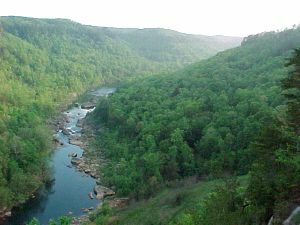 For another look at these rapids from the other side of the river, go to the bottom of the page. Blue Heron, a very powerful and beautiful bird found from coast to coast spending winters throughout the south. To the Diné, Blue Heron is God of the South. Nearby, there were other mines named Scarlett Tananger and Red Cardinal. Giving the mines such exotic names was designed to establish an identity, to spark a connection in the consumer's mind that this was not merely common coal; far from it. This was something rather special - coal from a certain, high quality seam in Kentucky... You are not simply buying a generic commodity here. This is not simply survival, this is an expression of an informed awareness, the exercise of personal freedom, a mark of individuality. I say, Throw another hod of that bloody Black Grackle in the burn box, would you Jack? <-The tipple received the trams in the upper room. The gondolas held about three tons each. (It was one of these little coal cars that pinned our friend Charlie Winchester to a wall and crushed his pelvis.) To insure quality, a magnetized chute removed any metal which may have broken off the mining tools and someone looked it over to pick out any trash rock before dumping the load into a system of screens and shakers where it was automatically sorted by grade and loaded into the appropriate car. The tipple could grade enough coal to load 55 train cars a day. This quiet little valley was incredibly noisey and dirty sixty years ago. The level of technology shown in this picture to the rightwas mastered in the mid-1800's-> Iron for the car and rails, wood treated with creosote laid on a bed of gravel. 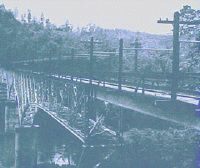 Forests were levelled to produce charcoal to process iron ore, crucial to the generation of steam to power the locomotive. Vast areas of woodland quickly became lumber once the rails penetrated the wilderness. When coal became more economical than wood, the trains carried the black stone from the mines to the mills. Timber, iron, and coal came together in the railroad, the horse of the industrial revolution. Millions were employed in these interlocked concerns. Two thirds of the nation's coal is still carried by rail. In less than 150 years, railroads have brought incalculable changes to human life, for better and worse. The rails have been expanded by the Interstate Highway System and air traffic, just as business which was previously limited to the postal service, telegraph and telephone has come within the province of the Internet. Gandhi saw the telegraph and the railroad as dark developments, yet he employed both of them. On the positive end, there is an increased potential for trade, travel, communication and all manner of cultural exchange. These benefits are seriously compromised by an expanded capacity for environmental and cultural destruction under the influence of ignorance and greed. This makes the possibility of developing higher intelligence, and the arising of practical wisdom that much more imperative. <-Looking upstream from the east bank. These two shots were taken two weeks later on a return trip to the area. We had to pickup Zoe's car from the mechanic, (blew a headgasket) so we took the opportunity to pack a lunch, invite some friends and went to Yahoo Falls for a few hours before catching the late afternoon sun from the Blue Heron Overlook.